As you may recall, my studio had some water damage from before we moved in. This led to the tearing down of the beautiful ceiling. I salvaged all of that wood and began making signs out of it to pay for restoration. A few of those signs ended up in the hands of my beautiful friend Camille after a tragic event in her family. God used that ceiling to bring us together. We became friends because she ordered some things from me on the internet. She is now one of my dearest friends. 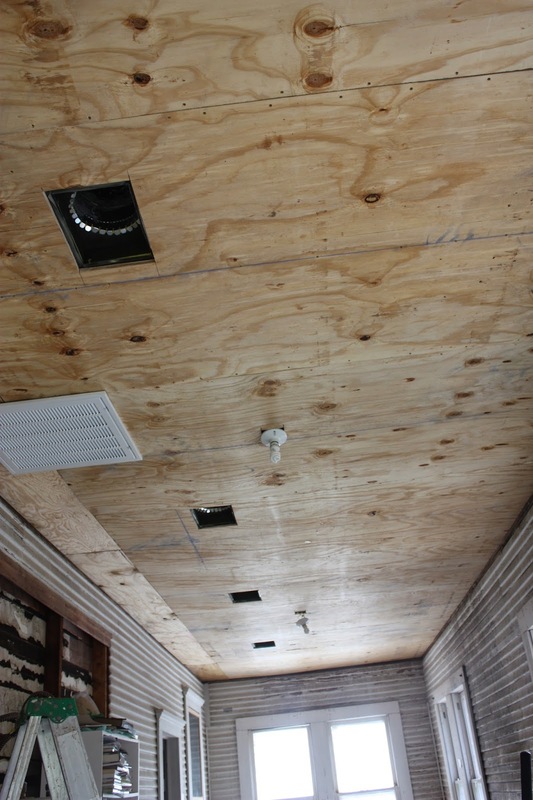 As we had duct work ran out to this room, we had to get a ceiling up before we could run it. Denbigh and Camille's husband have become really good friends as well. When we needed to get a ceiling up ASAP, Denbigh called John and asked for help since he is a custom home builder. Of course, I am thankful for John's extreme generosity. Today I was struck by something else. God brought our families together by ripping down this ceiling. 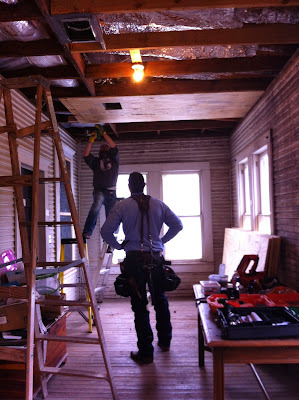 Tuesday, it came full circle as John came over and helped put a new ceiling up. I had this realization today. God can do whatever he wants by whatever means He wants to. 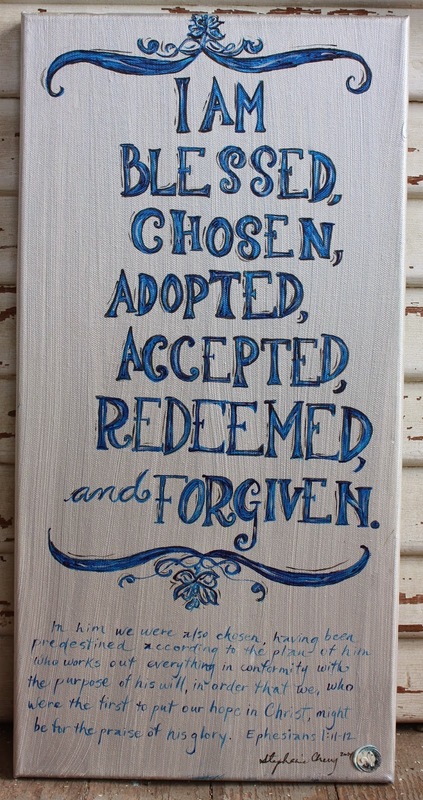 God is a God of redemption. He even redeems ceilings. I tried to get a good picture of the whole room, but it is really impossible to do. It runs the whole length of the back of our house. It is 360 square foot and has 12 glorious windows. We will put the bead board up and strip the wood walls in there. I cannot even tell you what a glorious thing it is to paint in this room. Thank you for everyone who donated to us. That ceiling alone costed over $600. *I have a feeling that this room will house many youth to sleep over for mission trips. Christmas is coming. Check out the goodies in my Etsy shop. I give discounts for multiple purchases. Here is the best pic I could get of the ceiling. It shows about 2/3 of it. It is a big room. It is also heated and cooled. That seems pretty crazy to me. I have never been able to work out here in the winter. The guys at Southern Comfort did an amazing job. 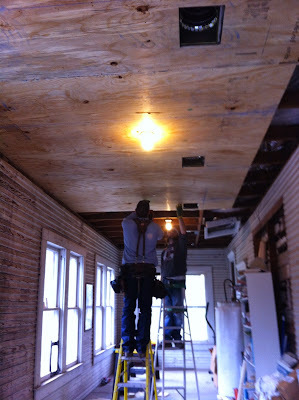 They will be back sometime after the first of the year to run ducts under our house to heat and cool the first floor. If you are going to buy a pie for Thanksgiving, think of us. We will be delivering to Waco, Kyle, & New Braunfels. We use that money to feed our guests here at Gomer for the year. Thanks so much. Love y'all. Be blessed in the Lord. I did a little math in my head the other day, y'all, because that's what delightfully nerdy people do. We figure stuff. We like right angles. Fractions bring us joy. I digress. Anywho, at the beginning of this year we needed $28,000 to refinance Gomer's House and God gave it to us. We need $28,000 in air conditioning and God gave it to us. We needed a car and God gave us two. Now, the thing that blows my mind is that God has somehow seen fit to give a couple of yahoos in the middle of nowhere somewhere close to 80 grand this past year. What. I remember our first few years when we paid for every single thing in this house out of our own pockets. That meant we did without most everything like sinks, kitchens, insulation, and heat...for years. We waited. After God directed my heart to start painting, my first fundraiser netted a few hundred dollars. I would cry every time someone bought something from me that cost $20. I cried the first time I saw running water in my new sink. Cried, people. Don't think I don't pray for wells to be dug throughout the world every time I turn on the faucet. Now, this past year has been a blur. Blllluuuuuuurrrr. I never really stopped and looked at all that happened. Something struck me the other day when I noticed God was providing for two things that cost an identical amount of money. Then I realized exactly how much that was. Then I realized how very much more He had given. I am blown away. Thanks for seeing us, Jesus. Thanks for shaping our hearts and then funding the Jesus love you put in there. You are more than I could say. You are everything laudable. I don't share a lot of the stories that go on inside Gomer. It is mostly because the things we deal with are very private and the pain is very deep. 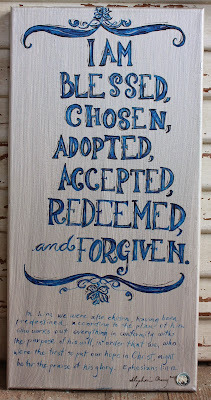 God has allowed us into some of the most broken places and I humbled that He would let us. I did want to share about our friend Amber. Denbigh met Amber in 2003 in Odessa, MO. He was there leading worship. Over the years, a mutual friend kept her up on Denbigh's whereabouts. In 2006, she moved to Texas with her family. 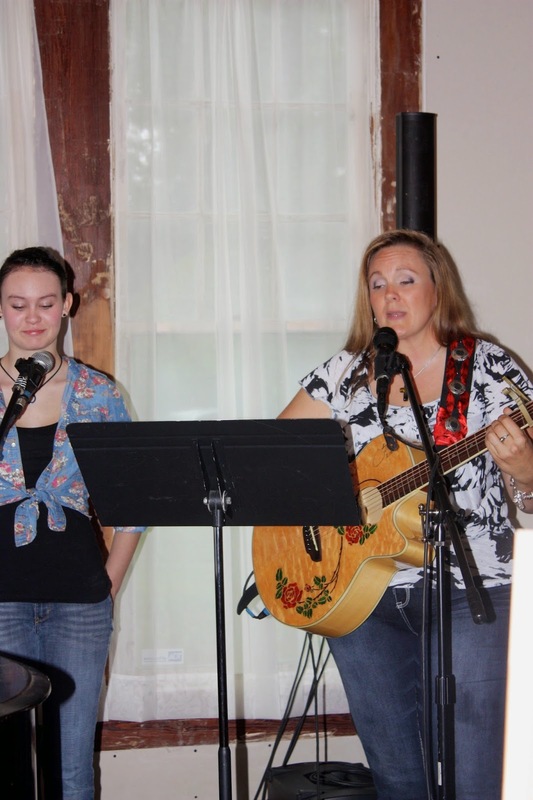 Later, her church was looking for a worship leader and contacted Denbigh. He didn't end up taking the position, but it did end up opening a door for their church to come spend a week with us and do some mission work this spring. A few short months later, her husband was diagnosed with liver cancer. He went to be with the Lord in September. She came and spent the afternoon here on the way to pick up his ashes. The most brave and beautiful thing she did was come and sing to kick off our fundraiser just a short time after her husband had passed away. I share this because God brought our hearts together before this all happened. He reunited us all this year. He knew full well what the year would hold. He is sovereign. He has grown our friend Amber into a beautiful woman of faith. Come out next year to the fish fry. I'm sure Amber will be back on the ticket. Pray for her and her daughter as they find their new normal. Pray for peace and encouragement. Pray for provision. Lean in and listen for the stories of the people around you. I am sure that you can tell by looking at the cover of this book that I am head over heels for it. Look at those prawns, y'all. They are so beautiful that I want to hug you. This book made me happy. Even if were not full of amazing recipes, the witty banter and food photography is enough to bring joy to your heart. I remember when cookbooks were just photocopied recipes. This is like a bonus book inside page after page of culinary delight. 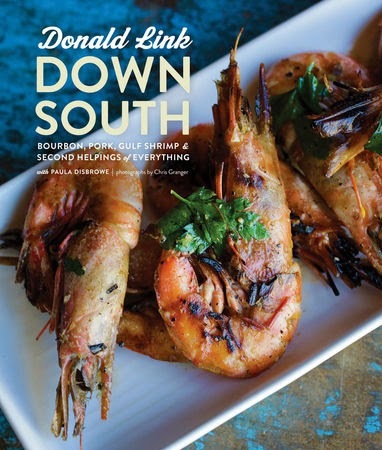 From a cocktail entitled The Cherry Bounce, to gougéres, to rémoulade, beignets, and spicy grilled quail, this book has it all. It's a little bit fancy and a bit down home. Of course, there are crazy whole animal recipes that I could never conjure up the courage to cook. Perhaps that just makes me a semi-Southerner. People who cook whole ducks, alligators, and pigs are a brute force to be reckoned with. Pick this book up. Even if you just set it on your counter and never open it up, it will make you happy. You can also decide to open it, slather something with butter and fall helplessly into pure bliss. I read this book. It took me a while. I hate to even write a review about it because I didn't like it very much. I have a hard time not liking things. I mean, I have to work at it. I just couldn't get into it. I thought it was going to give some sort of biography of this famous convert to Christianity, but it was just a bunch of "yodaesque" dialogue. I thought the writing could be easily confused and misconstrued. There were about five sentences that I thought were interesting and helpful to me. I am sad to say that I cannot recommend this book. 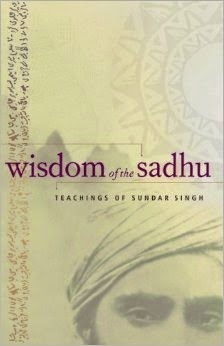 The Wisdom of the Sadhu was graciously provided for review by the publisher.